Now that Joaquin "El Chapo" Guzmán, the leader of Mexico’s powerful Sinaloa Cartel, has been recaptured in his home state of Sinaloa on the west coast of Mexico, the pressure is on to extradite him to the United States. El Chapo in the love hotel - Three strikes? The U.S. has an outstanding – and still valid – extradition request, but don’t expect it to happen any time soon. The life-long criminal, who has now escaped from two separate maximum security prisons in Mexico, has become such an embarrassment to the Peña Nieto government that it simply cannot withstand the additional humiliation of handing him over to the gringos. One possibility, should El Chapo remain in custody, is that he be extradited when a new administration takes power. That way Mexico – and Peña Nieto – save face. The new administration can burn a little political capital, and the next president can start his or her “sexenio” (six year term) on a good footing with Mexico’s most important ally. Given that the election will be on July 1, 2018, and the president will take power in December 1, 2018, expect the extradition sometime in the first half of 2019. Will Mexico be able to keep El Chapo in jail until then? We’ll see. In 2001, Guzmán escaped from Puente Grande maximum-security federal prison in Guadalajara by bribing guards; and this past July he escaped through a tunnel from the maximum-security Altiplano prison west of Mexico City – likely also with the assistance of corrupt officials. Pressure is already building to keep Guzmán in Mexico. Miguel Barbosa Huerta, Senate House leader for the left-of-center PRD, stated after the arrest that the drug lord should serve his time in Mexico. One alternative, he said, was to perhaps “have a secure room within the Interior Ministry or within the Navy” – a clear acknowledgement by a Mexican legislator that he believes the Mexican penal system is broken. In any normal country, such questions would seem normal. In Mexico – certainly in Sinaloa – they are laughable. When El Chapo was last arrested almost two years ago there were demonstrations of support for the kingpin in Mazatlán and in the state capital of Culiacán. Guzmán is a folk hero to many, particularly to rural campesinos who have suffered from generations of corruption and violence – often at the hands of the government – and for whom the drug trade is the only viable way to make a living. If you don’t believe it, watch this incredible video as hundreds take to the streets after his arrest in 2014. No one covers their faces as they yell their support. The band plays as the cops and military drive by. This most recent arrest, carried out in a dawn raid on January 8 in the northern coastal town of Los Mochis, is itself an indication of the desperately corrupt state of Mexico’s institutions. As is typical in arrests of top narcos, there was little involvement of local or state police. In this instance it looks as if even the federal police and their judicial overseers, the Attorney General’s office (PGR), were kept at arm’s length. It only makes sense: between April and November of 2015, the PGR arrested 209 of its own people for offenses ranging from extortion, bribery, embezzlement, “express kidnapping”, theft, sexual harassment and fabricating documents – with a further 112 arrest orders issued. All told, 27 federal investigative police and 115 federal prosecutors lost their jobs. And within Sinaloa itself, recent data from the Executive Secretariat of the National Public Security System has shown that almost half of all police officers failed a recent “confidence exam” – though there were no details on what this exam entailed, or what the consequences might be. For those readers quick to cast aspersions on those brave Marines on the front lines of this fight, recall the story of the Marine* Melquisedet Angulo, who died in a firefight during the takedown of the powerful drug lord Arturo Beltrán Leyva in Cuernavaca in 2009. This was a coup for then President Felipe Calderón, who was three years into his brutal – and increasingly unpopular – drug war. Calderón, hoping to boost public morale, decided to turn Melquisedet Angulo into a national hero. The Beltrán Leyva organization responded by showing up at the family home in Tabasco with sledgehammers and assault rifles. They proceeded to murder his mother, aunt, brother, and sister, with another sister seriously wounded. 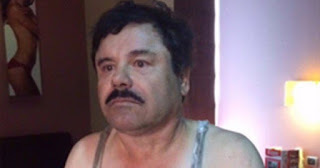 When El Chapo was arrested last time – in Mazatlán, Sinaloa, on February 22, 2014 – no shots were fired. It was a tougher go this time. The tip-off came when a citizen noticed armed men at a house, and presumably the call was passed directly to the Marines, who cased the joint. In the ensuing firefight, which included 50-caliber machine guns, five gangsters were killed, six were injured, and several captured. One Marine was wounded. The wily Guzmán and number one hitman, Iván Gastelum, escaped out back through storm tunnels, and high-jacked a car. The Marines, who were already well aware of the storm sewer strategy, and who had been notified by the terrified vehicle owner, tipped off federal police, who actually did their job and captured Guzmán on the Los Mochis-Navojoa highway. But, as further evidence of the level of distrust among officials, and the general level of insecurity in Sinaloa, the Marines took possession the most wanted man in the western hemisphere from federal authorities of the government of Mexico and took him to....a love hotel. That's tight: a hotel that rents by the hour. And from there they awaited for trusted Marine reinforcements to take Guzmán to the airport, from whence he was transported to Mexico City in, you guessed it, a Marine helicopter. After the press conference in Mexico City, in which Guzmán did the standard 'perp walk' for the cameras, and authorities told a bizarre story of how he was tracked down, in part, via his desire to make an autobiographical movie of his life, he was whisked away - again in a Marine helicopter. Didn’t another president say that once, speaking too soon?